COMPETITION STARTS BACK UP TOMORROW AT 8:00am local time (7:00PDT – 10 EDT). 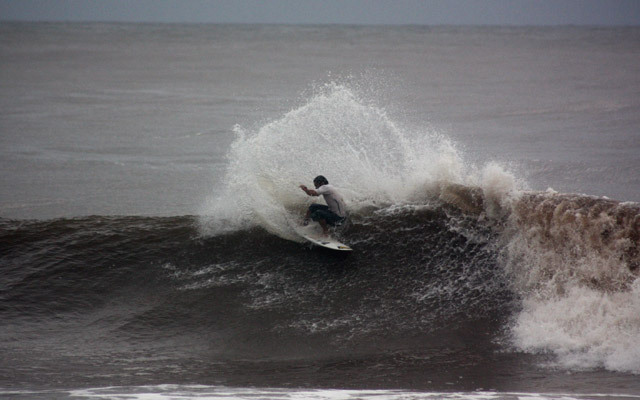 The strong rain came back to La Libertad today, but that didn’t stop the contest officials from running the second day of the El Salvador ISA World Masters Surfing Championship. The 3-to-5 foot waves kept breaking long and perfect with some barreling sections. Now that all the surfers in the event have competed in at least one qualifying heat, there are no more National Teams with all their participants still in the main event. Out of the 124 surfers that started the event there are now 40 undefeated in the main event; the remaining surfers are in the second, and last chance repechage. The oldest competitors in the tournament, Grand Kahunas (+50), went to the water for the first time and had, once again, South African Chris Knutsen as the best surfer of the division. Other standouts in the Grand Kahunas division were Jorge Bittencourt (BRA), Allen Sarlo (USA) and Manuel del Castillo (PER). In the Masters (+35), Grand Masters (+40) and Kahunas (+45), eight surfers per division remain unbeaten in the main event after making it through their second qualifying round. Davey Gonsalves (HAW), Junior Maciel (BRA), Magnum Martínez (VEN), Gary Van Wieringen (RSA), Toby Martin (AUS), Jojo de Olivença (BRA), Jason Senn (USA) and Ross Williams (HAW) are two steps away from the grand final in the +35 division. The eight Grand Masters that made it undefeated to the third round of the Main Event were Tom Curren (USA), David Malherbe (RSA), Guy Chang (HAW), Dean Shaw (AUS), Jim Hogan (USA), Colin Buitendag (RSA), Mike Latronic (HAW) and Rowan Sapwell (AUS). Three-time ASP World Champion, Curren shined today, not only winning his heat but also posting the highest combined score of the division so far 14.40 (7.5+6.9) to beat David Malherbe (RSA, second), Ricardo Villanueva (PUR, third) and Sergio Penna (BRA, fourth). Grand Masters’ Fabio Gouveia (BRA), Juan Ashton (PUR), Dean Randazzo (USA), Che Lovelace (TRI), Jojo de Olviença (BRA), Kevin O’Brien (RSA), Reuben Balmores (HAW) and Scott Myers (AUS) made it through to the third round of the Main Event.